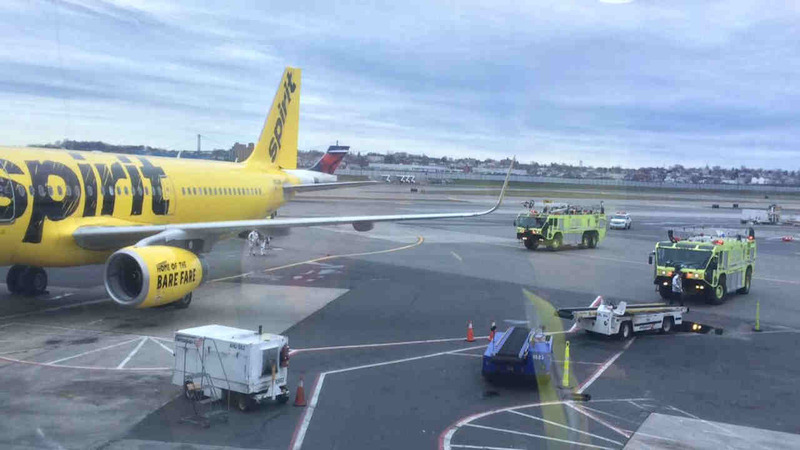 NEW YORK CITY, NY -- Spirit Airlines Flight 197 from LaGuardia Airport in New York to Fort Lauderdale, Fla. was evacuated Saturday morning because of a smoke condition on board. The plane was at the gate preparing for an 11am departure when passengers started seeing smoke coming from the left side of the plane. The plane was evacuated. Nobody was injured, but passengers said there was panic on board when they were told to leave. A Port Authority of New York and New Jersey police spokesman said firefighters didn't find any smoke when they responded. Airline spokesman Stephen Schuler said there were reports of sparks in the power unit that provides electricity to the Airbus 321 when it's grounded. He said the unit automatically turned itself off after detecting an issue. Spirit Airlines released a statement on the incident, saying the plane was being evaluated. "Passengers aboard Spirit Airlines Flight 197, scheduled for a 10:59am EST departure from New York's LaGuardia Airport (LGA) to Fort Lauderdale-Hollywood International Airport (FLL), were deplaned at the gate following reports of sparks in the auxiliary power unit (APU). The APU, a generator which provides electricity to the plane when it's on the ground, automatically detected the issue and immediately turned itself off. All passengers safely exited the plane and we are working to keep them up-to-date at the gate. Our maintenance team is evaluating the plane and conducting safety checks before it's cleared for takeoff. We apologize for any inconvenience to our customers and we are offering to rebook any passengers who prefer to take another Spirit flight." There were 228 passengers and 7 crew members on board. Spirit Airlines was working to rebook passengers.